Jadhara is a treasure for sure. She is the daughter of Dhar Aziza born to Aziza when she was 24 years old. Aziza was a very special rare Babson Brown mare that came to me when she was 23 and I immediatly bred her to my Babson Brown stallion HR Jamil Ahmar Hisaan and they produced Jadhara. I have been very blessed to have this mare. She is just gorgeous. 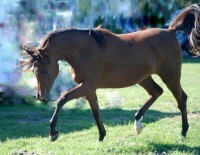 She has been producing fabulous foals with beautiful faces. Jadhara has recently produced a colt and a filly by Gabriel MCA. They are both amazing Babson BlendTM Straight Egyptians.